SACRAMENTO – Assembly Bill 1086, a CalCAN-sponsored bill, passed out of the Assembly Water, Parks and Wildlife Committee earlier this week. 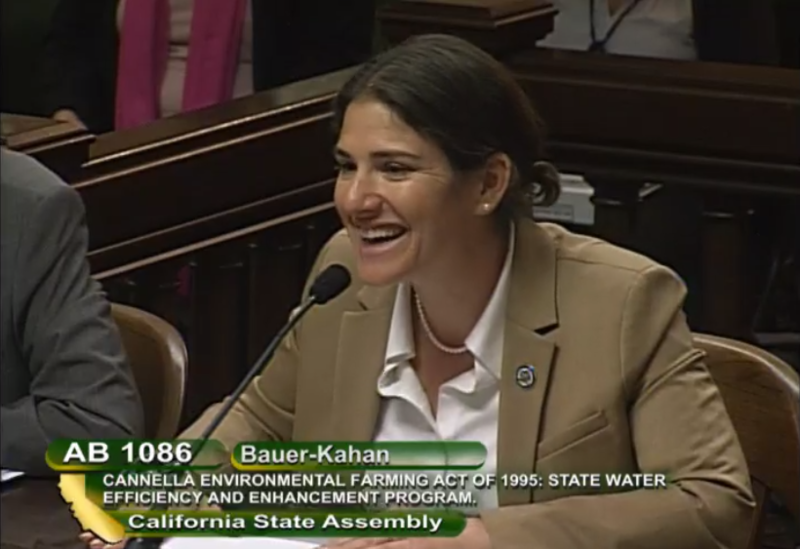 The bill, authored by Assemblymember Rebecca Bauer-Kahan (pictured above), will codify into law and make stakeholder- and expert-driven improvements to the State Water Efficiency & Enhancement Program (SWEEP). SWEEP is the only state program that incentivizes farmers to improve on-farm water use efficiency. The program provides financial assistance to growers for improvements to irrigation system that reduce both on-farm water use and greenhouse gas emissions. The administering agency, California Department of Food & Agriculture (CDFA), estimates that over 75,368 metric tons of CO2e will be reduced annually through the state’s more than 600 SWEEP projects, the equivalent of removing 16,139 cars from the road for one year. Moreover, CDFA estimates that SWEEP projects will reduce recipients’ annual water use by over 101,050 acre-ft, enough to fill 50,000 Olympic-sized swimming pools. Learn more about SWEEP. Since its inception in 2014, CalCAN has been the leading advocate for SWEEP because we know that drought is a persistent threat to farmers. Despite occasional wet years, climate scientists predict the risk of drought to increase by 50 percent over the next 80 years by 2100 (Pathak, 2018). CalCAN bases our work on SWEEP directly on stakeholder feedback. For our most recent report on SWEEP in 2018, we interviewed farmers with program experience, technical assistance providers who had worked with more than 150 applicants, and reviewers who had evaluated hundreds of SWEEP applications. Also see our 2016 SWEEP Progress Report for a much more quantitative analysis of program impacts. CalCAN has worked closely with AB 1086 author Assemblymember Bauer-Kahan’s office to incorporate key program improvements in the bill to increase SWEEP’s reach and effectiveness and prepare the state’s farmers most at risk of the next drought. 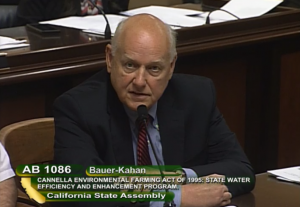 AB 1086 would continue to aid farmers and ranchers in conserving water and energy while also expanding the program scope to consider groundwater sustainability and water quality. The bill also calls for targeted, culturally competent training for irrigation operators to maximize the benefits of these SWEEP projects. Irrigation companies unfortunately do not offer such trainings because it is not a profitable aspect of their business. AB 1086 authorizes CDFA to fill the gap and fund trainings by qualified technical assistance providers like those at the University of California Cooperative Extension and many Resource Conservation Districts. AB 1086 also seeks to improve the reach and impact of SWEEP funding by including provisions to prioritize small farms (500 acres or less) and socially disadvantaged farmers and ranchers in the application process. To ensure that SWEEP synergizes with the many regional efforts across the state to achieve groundwater sustainability by 2040, the bill would also authorize CDFA to pursue integrated pilot projects with local irrigation districts and Groundwater Sustainability Agencies. With its passage out of the Water, Parks and Wildlife Committee, AB 1086 now heads to the Assembly Appropriations Committee. We will post updates on our blog about the bill’s progress. Sponsoring AB 1086 is one of many of CalCAN’s policy efforts ensure California farmers and ranchers have the resources they need to remain resilient and viable in the face of climate change. If you would like to learn more about or support this bill, let us know. Send an email to brian(at)calclimateag.org. If you have experience with SWEEP that you’d like to share, please drop us a line at info@calclimateag.org. CalCAN occasionally publishes stories of farmers and ranchers practicing exemplary water stewardship and we’d be happy to consider sharing yours.